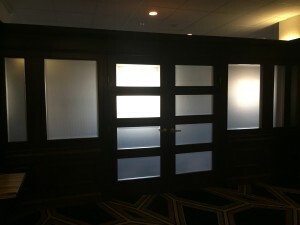 Xlnt Tint, Owings Md., was called on to add 3M “Seattle” decorative film to the Hilton Hotel in Arlington Va. The resulting appearance was elegant and allowed guests to have privacy while enjoying the comforts of their surroundings. Decorative films are an XLNT way to add privacy and improve the appearance of ordinary glass. Call Xlnt Tint at 410-257-5511 for more information about decorative films.